About a year ago I wrote this article about why you should never take your ebike to Black Rock City unless you were building an incredibly awesome Mutant ebike. A couple of my friends, Doug Shire and Laurence Clarkberg (look mom, I really do have friends), wasted thousands of dollars and hundreds of hours of time to essentially bring one of my really bad ideas to life. 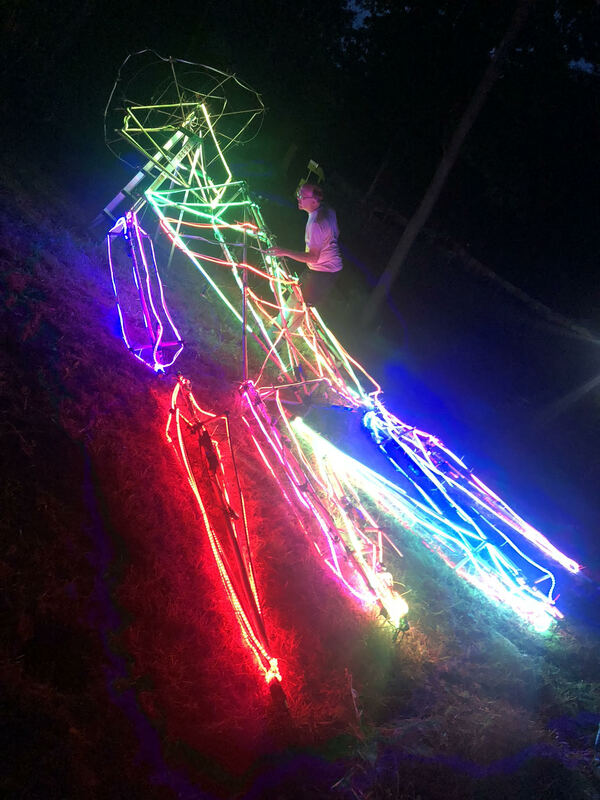 I’ve been to Burning Man at least 10 times and five of those burns I have spent the entire burn building large articulated puppets that I carried on my back around the playa. The biggest one was 43′ tall (true story) and that was just no fun at all so I’ve essentially given up on trying to carry anything bigger on my back. 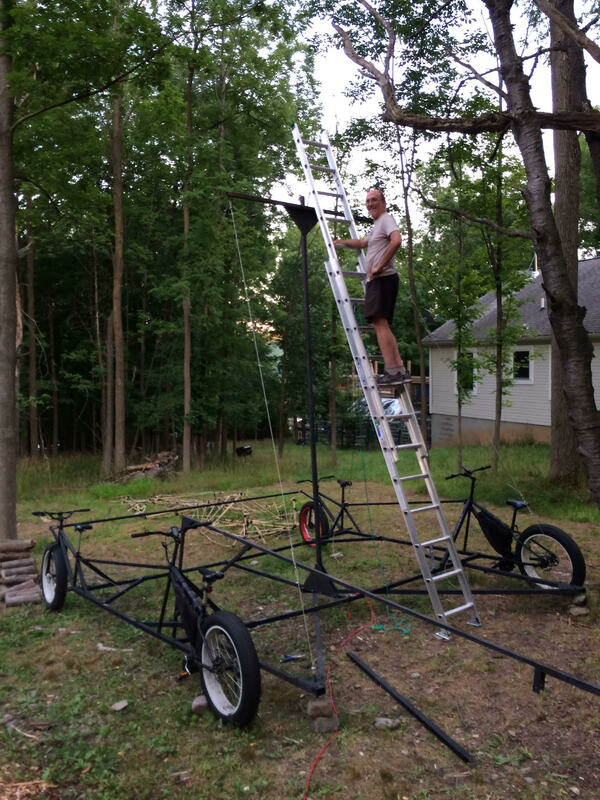 I had the idea to build a 4 person ebike mutant vehicle and hang a 30’+ bamboo led covered puppet on it, but in all honesty, I never had the motivation, capital, and inclination to make it happen. One of my best friends did have all three of those things, so with many lost hours spent in the basement of the Ithaca Generator (a group of cool people who make stuff) Doug and Larry built this creation then got it all the way from NY to Nevada for this year’s burning man. Since I couldn’t be there this year (I went to Denmark for 2 weeks instead) they called the Man Alive puppet ‘Karl’ out of respect for my vision and contribution to the build (which wasn’t much). 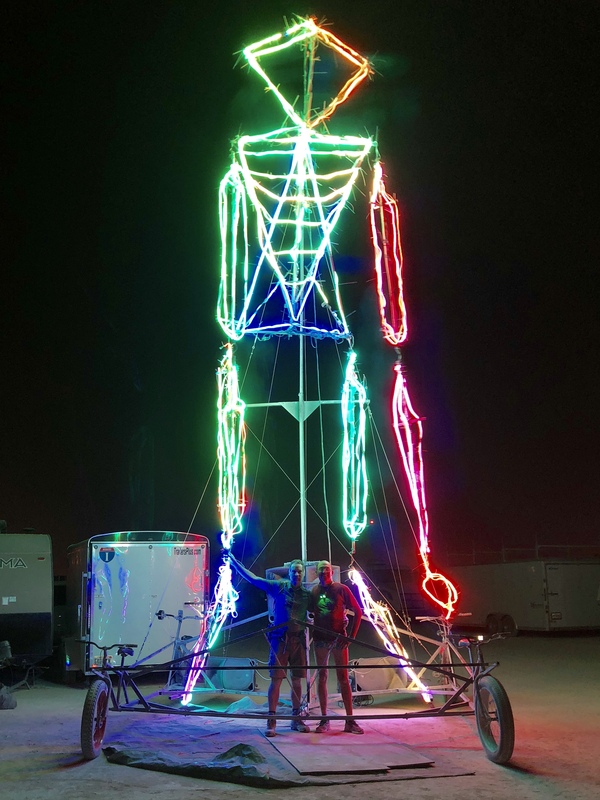 This article talks about the process of building this piece of art and why you should build a mutant art ebike installation instead of building a mutant gas-powered vehicle like every other mutant vehicle on the playa. I knew that I wanted the puppet to have 2 separate BBSHD drive units with separate batteries, one on each side. 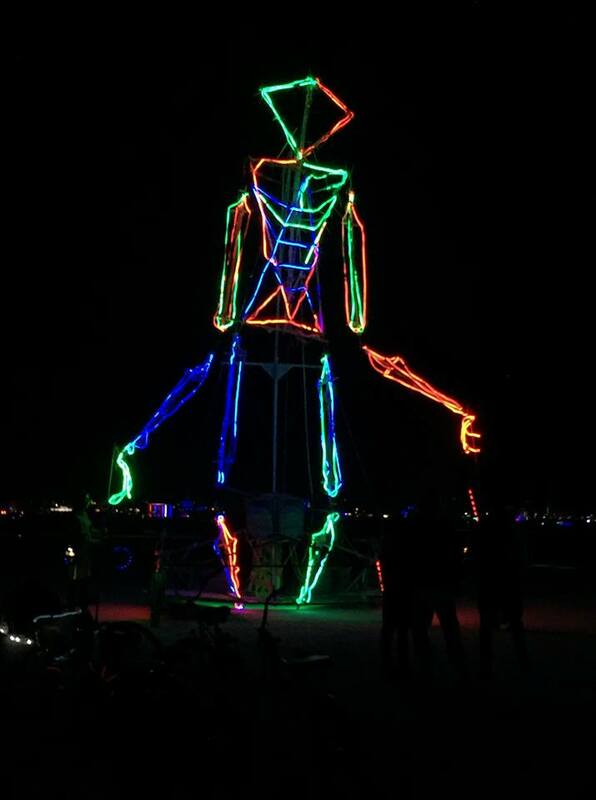 This way if there was any issues we wouldn’t end up having to pedal the sculpture for miles across the playa. I also wanted to make sure the BBSHD was geared way down so that if we had to pedal it home, then we could. Initially, we started out with the TIG welder chopping up a Dolomite for the rear and a beast for the front. Since these fatbikes are <$200 at wally world we had a bunch of them kicking around the Boxy Bikes ebike shop. If you use a massively offset non-drive side crank then you can mount a standard 68mm BBSHD on that steel frame. The other prerequisite was that the bikes and frames had to be steel because we knew the Mutant ebike was going to be heavy and it was going to have to carry 4 full-grown (but still kids on the inside) adults. It’s also nigh impossible to weld steel to aluminum (and have in not break). Laurence was the TIG welding ‘expert’ so he guided us through most of the welding process. We took turns making laughably bad welds on the TIG welder, but at the playa nothing fell apart, so I guess that’s something. 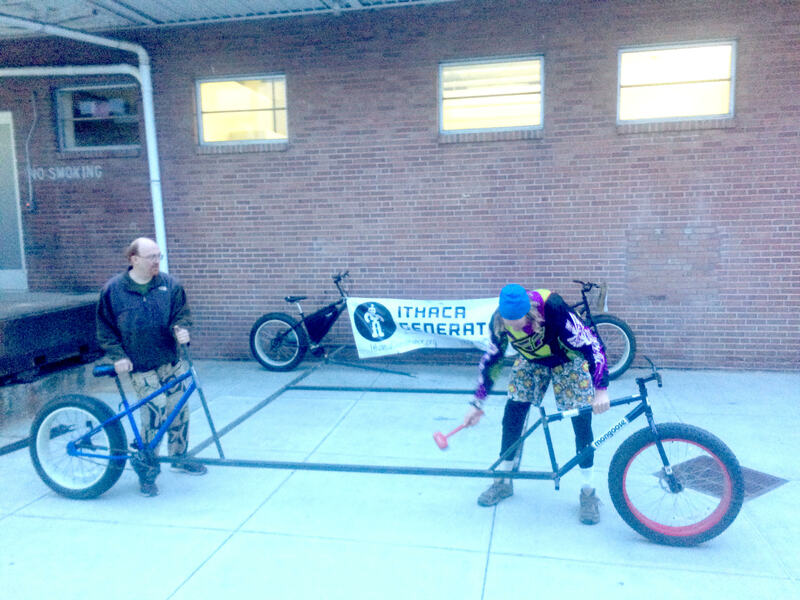 When we finished the first 14′ long ebike we took it out for a spin on the streets of Ithaca at night. It handled even worse than I thought a crappy ebike that was 14′ long and had 2 people on it would handle, so we ended up adding a top bar to keep the bike from twisting so much when we rode it. When welding you want to focus on building as many triangles as you can as triangles are the strongest shape that don’t contort under pressure. We bought most of the tubular steel at the bulk steel place and it was shockingly cheap (but it is also dang heavy). We tried to make a tower that we could raise up, but that was a bad idea, as the steel bar that levered up could not support any real weight without bending. In the end, we used a tower structure with steel cables that supported the tower and then a pulley system to raise up the puppet. Being left out in the rain the bamboo puppet absorbed a massive amount of water (even covered with a tarp) and more than doubled in weight. Luckily after a few days in the desert, it dried out quickly and the puppet ended up being a more manageable weight (around a 100lbs). Ironically we never were able to even erect the puppet in Ithaca before we had to cram it in a crate and ship it out to Reno. We spend a whole day and built the crate from scratch out of lumber and plywood. The crate is going to be the puppet’s home now in Reno so we wanted to do it right. You are one of the most amazing people I know and still you show up at Burning every year without bringing any of yourself here and you just enjoy everyone’s else contribution. What’s up with that?